Ignoring Friction: What's Next in the Evolution of Biofuel Production? What's Next in the Evolution of Biofuel Production? First-generation biofuels are made from starch, sugar, vegetable oil and animal fats. Ethanol, the most common biofuel used worldwide, is produced by fermenting sugars derived from wheat, corn and other sugars and starches from which alcoholic beverages can be made from. 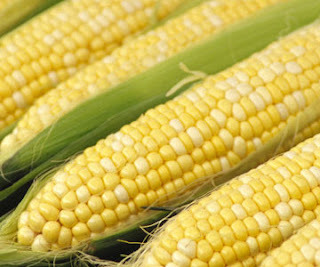 (Image to right: Corn is commonly used in the production of ethanol (2).) Ethanol is produced by microbial fermentation of the sugar. Starch can be economically converted to sugars for fermentation. However, cellulosic ethanol, where the cellulose part of a plant is broken down via enzymes to sugars and converted to ethanol, is also utilized but is economically less viable. For the ethanol to be usable as a fuel, water must be removed and most of the water is removed by distillation. Then dehydration occurs to remove the rest of the water from the ethanol/water mixture (3). Cellulosic ethanol is a type of biofuel produced from lignocellulose, a structural material that comprises much of the mass of plants. Production of ethanol from lignocellulose has the advantage of abundant raw material compared to sources like corn and cane sugars. The drawback to it is that it requires a greater amount of processing to make the sugar for the microorganisms that are typically used to produce ethanol by fermentation. However, one of the benefits of cellulosic ethanol is that it reduces greenhouse gas emissions over gasoline (3). 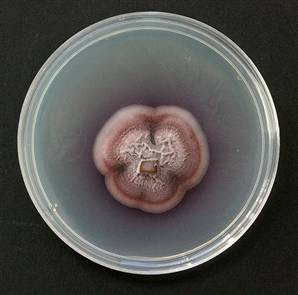 A new fungus, Gliocladium roseum (Picture to left: G. roseum growing on a petri dish. (9)), has been discovered that could potentially be a new source of biofuel. Gliocladium roseum lives inside the Ulmo tree in the Patagonian rainforest and possesses the metabolic processes to produce a variety of hydrocarbons that are s imilar to those of petroleum derived diesel. The fungus utilizes cellulose to produce diesel compounds, which makes it a better source of biofuel than other sources since cellulose is the most abundant carbon compound in most plants. The fuel that it produces has been termed “myco-diesel.” “Although the fungus makes less myco-diesel when it feeds on cellulose compared to sugars, new developments in fermentation technology and genetic manipulation could help improve the yield for the future” (9). The genes of the fungus itself may lead to helpful new advances in the biofuel production. 9. Britt, Robert Roy. "Newfound fungus makes better biofuel ." MSNBC. 04 November2008. MSNBC. 20 Nov 2008 .